Larson Electronics, a company that specializes in industrial lighting products, has announced the release of a solar powered trailer equipped with a 30-foot mast, two, 265-watt solar panels and a 400aH capacity battery bank. 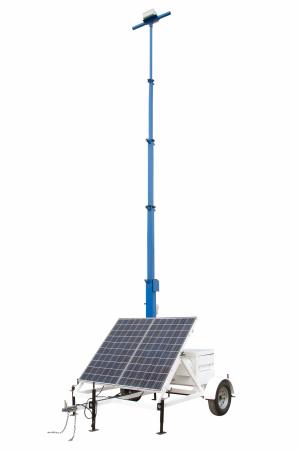 The SPLT-.53K-LM30-2XN3B-PW-TLR7 portable solar powered tower features two solar panels, a solar charging station, battery bank, and a manual crank up mast mounted to a seven-foot trailer with outriggers. This system delivers 12 volts for lighting, cameras, sensors or other electrical equipment mounted atop the manual crank mast. The three-stage steel mast is designed to allow operators to quickly and safely deploy electrical equipment. It can be extended 30 feet above the trailer floor for maximum coverage and collapsed to 13 ½ feet. The light tower can also be elevated to its full height by a 1,000-lb rated hand winch fitted with 3/16” galvanized steel cable. The mast incorporates a 16” by 16” by eight-inch junction box mounted at the top of the mast for connecting cameras and other devices. An eight-inch by eight-inch by eight-inch junction box is also mounted at the top of the first stage of the mast. External Nycoil tubing runs around the mast to allow operators to run Ethernet cable to the junction boxes. The tubing connects the junction boxes together and then runs from the smaller junction box to the job box mounted on the base of the trailer. This unit is capable of generating a total maximum output of 0.53 KW. The panels are mounted to a frame angled at 45 degrees for optimized light intake. All of the electrical components are encapsulated in a NEMA 3R job box that is bolted to the trailer. The seven by seven-foot single axle trailer provides a stable platform for the steel mast and mounted equipment. The two-wheel trailer is equipped with a 3,500-lb axle and leaf springs with 15” trailer tires. A standard two-inch ball coupling, two standard safety chains, and a seven-pin flat trailer plug allows for easy hookup and towing. Four outriggers mounted to the corners of the trailer allow operators to level the trailer and provide stability during deployment. Larson Electronics carries an extensive line of LED light towers, portable distribution systems, explosion proof lights, portable work lights and industrial grade LED area lights. You can view Larson Electronics’ entire line of lighting products by visiting them on the web atLarsonelectronics.com. You can also call 1-800-369-6671 to learn more or call 1-214-616-6180 for international inquiries.